Give a hand and help removing pesky horehound at an old sheep camp with a view. When: Sunday, 17 June from 1pm to about 4pm; give as much time as you like. Where: “Sheep camp south” Mt Majura ridge; click on this map to view the location of the sheep camp (red marker) and access routes (green lines). Meet with FoMM members at 12.30pm at the Mackenzie Street nature park entrance or walk in your own time. (1) From the nature reserve entrance Kellaway Street car park turn left then walk uphill (southeast) on the fire trail named Hancock road; pass the transmission power line easement after about 500m and continue walking uphill close to the saddle; turn left and walk the trail uphill in northeast direction to access the stock camp. The walk will take about 30 minutes from the Kellaway Street nature park entrance. (2) From the nature park entrance Mackenzie Street (roughly opposite Grayson Street) walk in east direction along the maintenance road (Blue Metal Road); at the saddle turn right, pass the upper Hackett water reservoir and walk uphill in southwest direction to access the sheep camp. Bring: Sun protection, sturdy shoes, drinking water, and gloves if you have them. Enjoy: Great views over Canberra and Majura Valley. Horehound is a common perennial weed often found at old stock camps that have nutrient enriched soils. Sheep camp south. 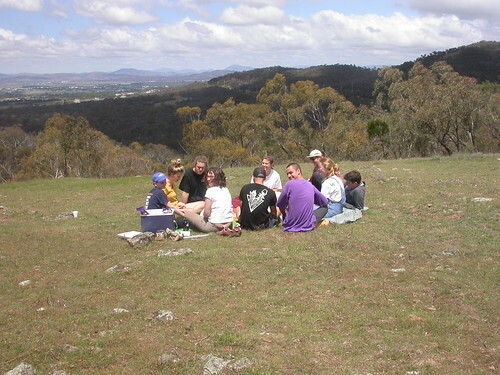 The approximately 5 ha area is one of several stockcamps located on the Mt Majura – Mt Ainslie ridge line. Four years ago, FoMM member Jochen began work to remove weeds (horehound, Saffron and other thistles, Hirschfeldia or Mustard weed, Verbascum, St John’s Wort, Serrated tussock and more).